Introducing a touch of the exotic, the Hand Painted Jungle Deco Vase features a decorative scene straight from the depths of the jungle. 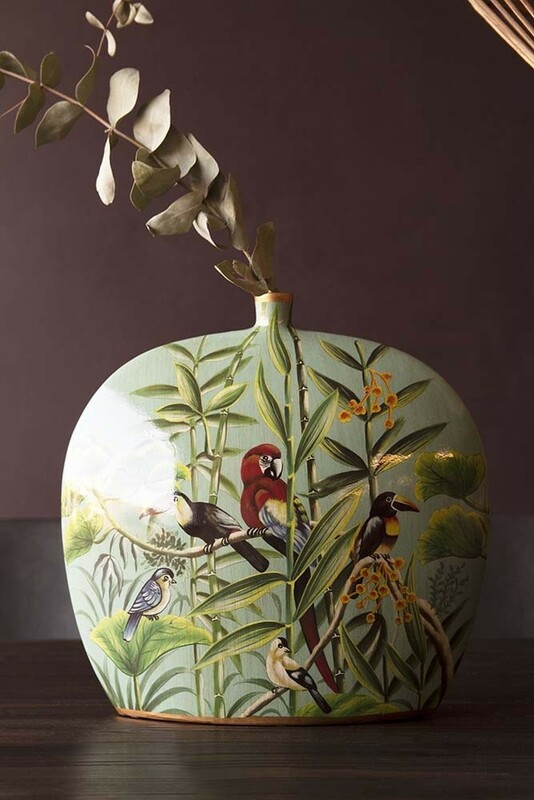 Measuring height 35cm x width 35cm, the vase is skilfully painted by hand to achieve incredible details on the birds, trees and leaves showcased within the design. As a hand painted piece, there may be small variations in the final finish, though in our eyes this only adds to the unique beauty of this statement vase. Capturing the life and colour of the jungle perfectly, the Jungle Deco Vase introduces a slice of paradise to your interior. 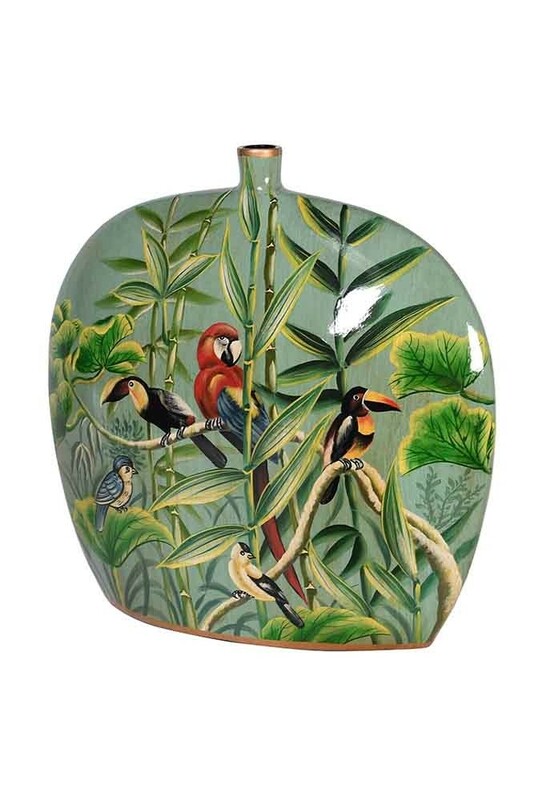 With every detail carefully painted by hand, the decorative Deco Vase celebrates the beautiful plumage of exotic birds, from parrots to toucans, and pairs these with towering bamboo plants and layers of lush tropical leaves. Taking inspiration from both classic and contemporary influences, the Hand Painted Jungle Vase combines sweeping curved corners and an Art Deco silhouette with recent revival for chintz and bold botanical scenes. Not one to be outshone in any situation, the jungle deco vase is designed to hold a stem or two of your favourite flowers or foliage. A stunning statement in any setting, create an asymmetric display of your Hand Painted Jungle Deco Vase on open shelving or style the Jungle Vase for all to see on the mantel piece, hall console table or dining room table as part of a bold and beautiful display.